Meet Hooray Horse, this adorable stuffed horse from the Cheery Cheeks collection. 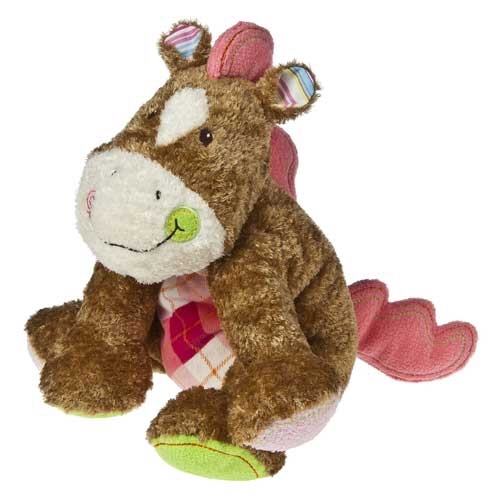 You are just going to love this amazing plush horse with her soft light brown fur with embroidered brown eyes, pink terry cloth on two feet, super-soft green fabric on the other two feet and cheek spot, soft salmon mane and tail, stripedy inner ears, and fun pink argyle tummy. She'll make you smile with just a glance and once you pick her up and give her cuddly, understuffed body a hug, this stuffed horse will steal your heart and become a most cherished friend for years to come.